When you think of Kansas City, you think of barbeque. On a previous visit TPP tried one of the classic and legendary BBQ places, and it had a lot of grotty old ambience, and OK BBQ, but it was just OK. 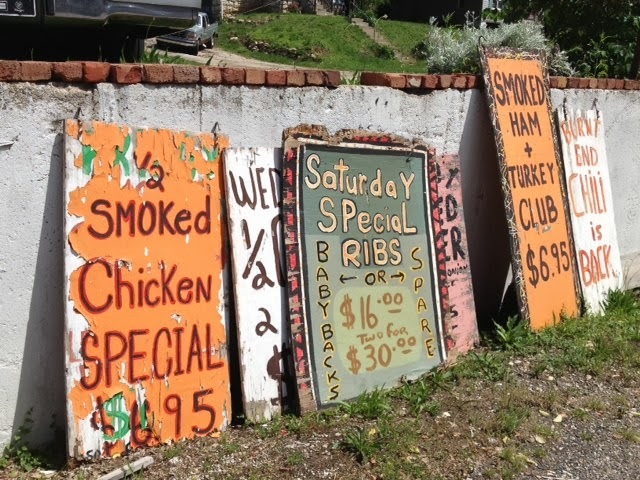 Some exploration, and some TV promotion, got us to the WoodYard BBQ. The down home, out-of-town, almost back-woodsie atmosphere gives you the immediate impression of some place authentic, the real deal, and it was the real deal. The big old smoker spreads the smoky aroma around pretty well, so everyone you meet for hours afterwards will know you've been doing BBQ somewhere. The baby back ribs were simply succulent, perfect. The F1 is quite the affectionado of pulled pork, and she was most pleased by her sandwich. And it's only about 10 min drive from downtown KC. You meal will be put on your table within minutes of ordering.